Halloween is five days away! What are your plans? Normally I don’t dress up on Halloween. I work as a science teacher; most days are spent either teaching labs or prepping for said labs. My cosplays are not exactly lab friendly as you might imagine. This year Halloween is on a Friday. I don’t have classes on Fridays so dressing up is kind of a wasted effort. BUT! My city is kind of small and the downtown businesses still do trick-or-treating for the kids. So I thought this year I would take the opportunity to dress up and walk the streets, without having to worry about getting home in time to get ready for work the next day. 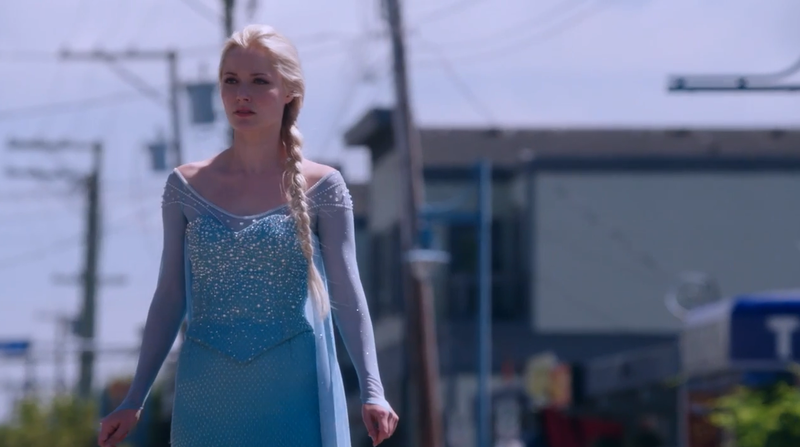 But then I saw the new season of Once Upon A Time…and I fell in love with their version of Elsa, played by the lovely Georgina Haig. While I love the costume design in the movie, there are elements on the OUAT version I also love. 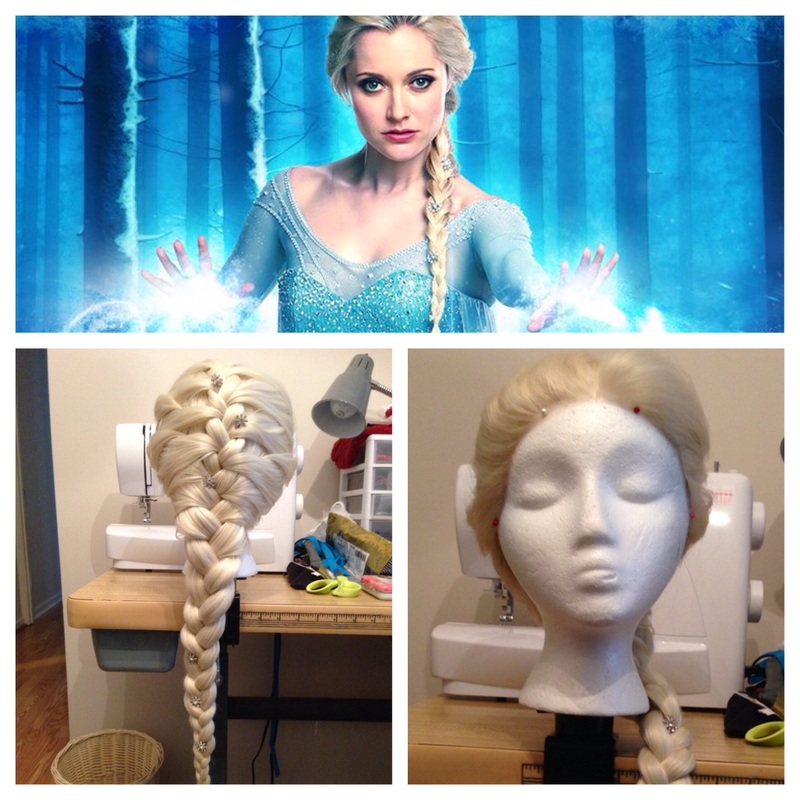 Since I decided to cosplay Elsa in her famous ice dress for Halloween, it was a good time to figure out how to combine elements. 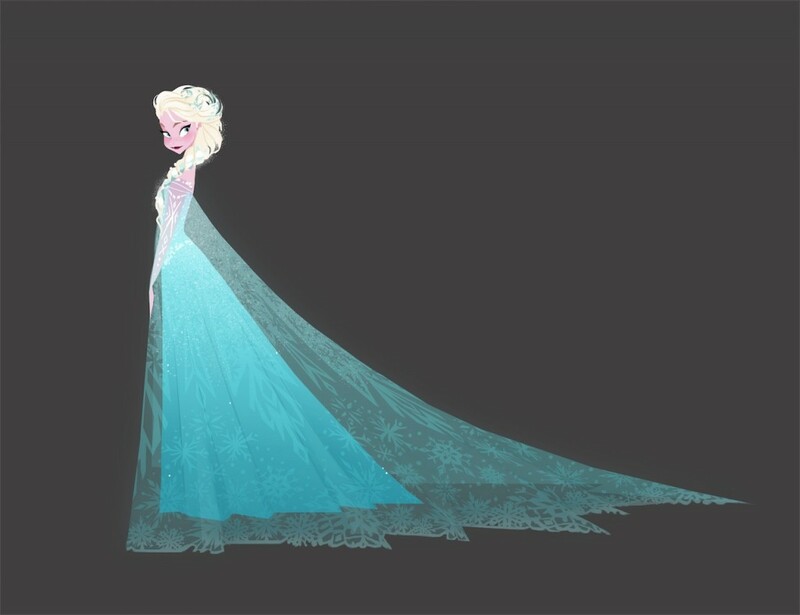 I am in love with the concept art by Brittany Lee so I took most of my references from the Art of Frozen book. 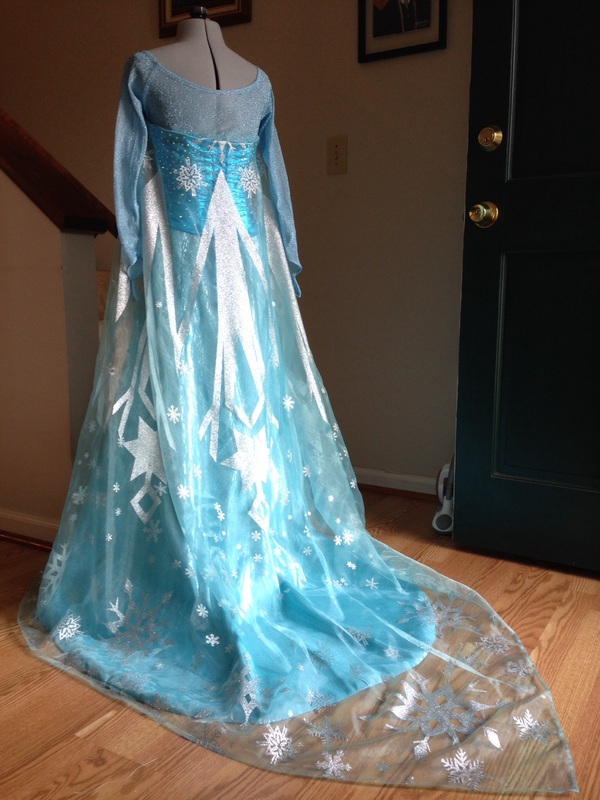 What I love most about OUAT Elsa is the simplified sleeves and the bodice. While the sleeves lack the X shaped design on the elbows and the neckline is more simplified, the fabric is much more sparkly by nature. Again, I found sparkly stretchy fabric on Etsy so all I have to figure out is the neckline (Do I want a string of rhinestones to make it easier or hand bead the neckline? Decisions.) 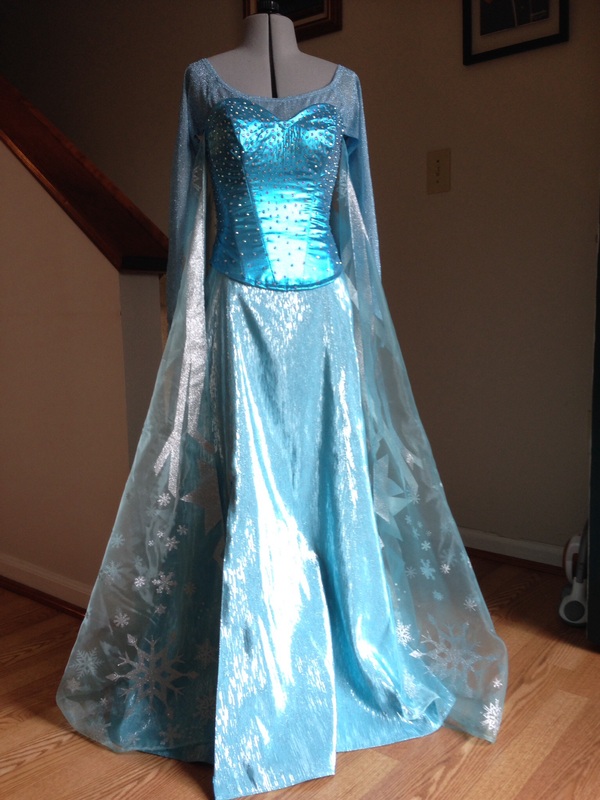 What I love about the bodice is the transition between round rhinestones at the top to the more icicle like look at the bottom to blend with the skirt. The costumers of the show seem to use the same fabric for the bodice and skirt. Mine is different so I plan to make the same transition with rhinestones in two sizes getting less and less dense towards the bottom. I also love the much more simplified braid in OUAT so my wig is a whole lot easier to style and manage. To make the wig, I started off with a Dany style wig from Arda Wigs in the titanium blonde color. I sewed in wefts from another blonde wig (that surprisingly had fibers of the exact same color) to make it a little longer and fuller. Since Dany is a single length wig, I made a few long bang cuts but then opted to braid those in to better match OUAT’s style. The rhinestone snowflakes are 6 rhinestone buttons either attached straight to the wig or to blonde colored bobby pins. 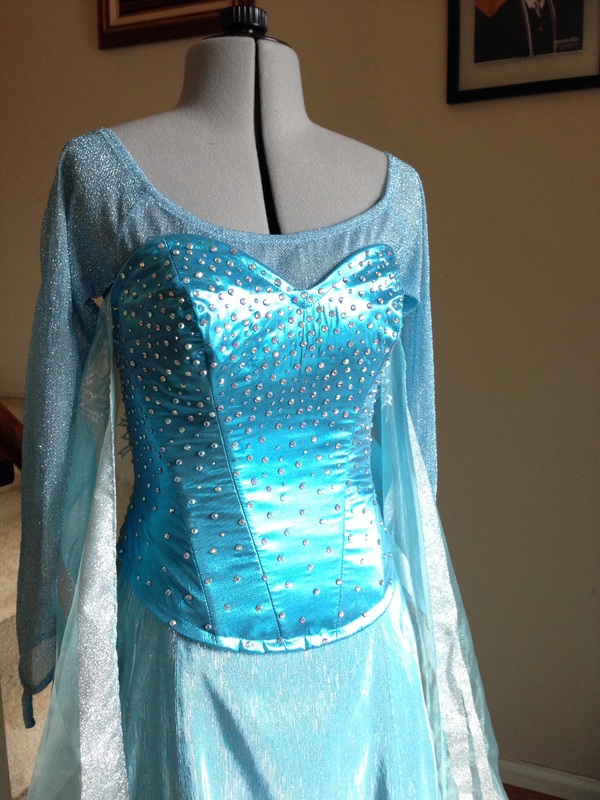 The bodice is made using the same pattern as my Elsa coronation bodice, Simplicity 1499 (I have plans to make Anna’s coronation bodice with the same pattern; it’s so universal). It’s made in three layers: one layer shimmery teal blue lame fabric, one layer non-stretch white twill (to stabilize the lame), and one layer cotton fabric with Frozen print. There is light boning and a lace up back. Unlike both movie and OUAT versions, I opted once again to make the bottom front rounded rather than pointed. I used the rhinestones to create a transition like effect; more rhinestones at the top and gradually decreasing their numbers to the bottom. The shimmery top is made of a semi-stretchy material with blue metallic threads woven in. I modified a raglan sleeve top to get the shape I wanted. Unfortunately for my first run the top looks great but is a pain to get on and off without contorting my body and over stretching the seams a little. I also could not add on the pretty chained rhinestones otherwise I lose the stretch factor. I plan to remake the top in the same material but have a back opening (non-accurate but easier on and off). The cape is attached to a length of teal bias tape then attached to the bodice by 8 snaps. It goes to just under the arm; my second cape I intend to come up around the bust, which is more accurate to the movie’s version. My shoes (not shown) are a glittery blue jelly wedge heel I got from the UK off eBay. They have a Mary Jane strap and are surprisingly comfortable despite how they look. They are not accurate but Elsa’s shoes would fall off my feet without the strap…if I don’t fall and break my ankles with the stiletto like heels.